It’s nearly summer. It’s Friday. It’s the afternoon. Let’s be honest here — you’re not doing jack at work right now. You have that fluttery summer’s almost here feeling in your chest and you need to just ride out that clock and look busy. So I want to help, by giving you an inane car challenge to make the time blur by. You in? Good. 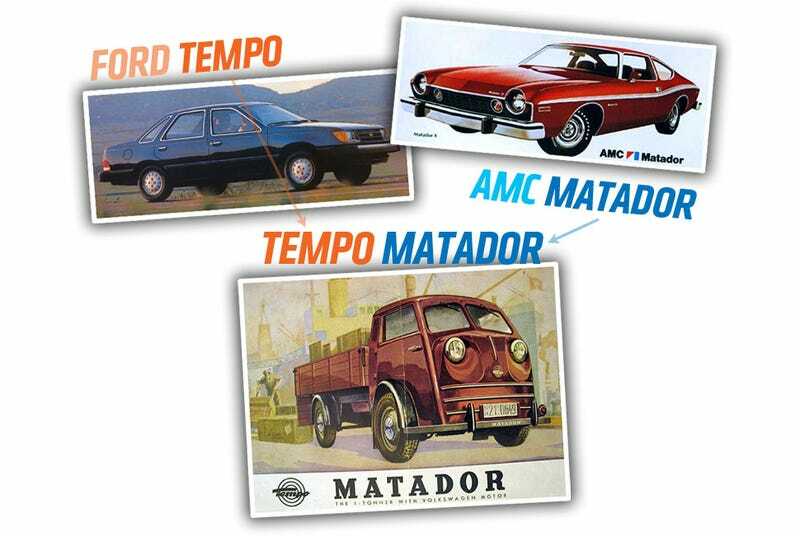 I realized that the name, Tempo Matador, could be formed from the model names of two other notable cars, the Ford Tempo and the AMC Matador. Realizing this, I screamed like a banshee and flipped over the table at the soft-serve frogurt shop I steal my WiFi from. Pausing to grab and fling some children’s frogurts onto the floor, I ran out onto the street, where I decided that I could not rest until I knew if this sublime mating of names existed anywhere else in Autodom. Can anyone else come up with a similar combination? Where the model names of two different cars combine to be the company name and model name of a totally other car? I think this must be possible, though the company names will be harder. But I bet it’s possible, even if the companies are obscure. I almost thought about making one from AC and Cord for an Accord, but that doesn’t really work. Is this hard as hell? Sure it is. Is my belief in the staggering geek power of the Jalopnik readership so unshakable I think someone will have an answer within an hour? You’re goddamn right it is. Maybe two hours.